If you have, say, a picky child or god forbid a picky adult in your house and they cringe at the idea of ‘new’ foods this might be a recipe for you. 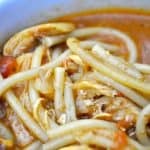 Think of this recipe for Coconut Curry Chicken Noodle Soup as a gentle introduction to flavors and spices they’ll really like without any fire or a lot of spice. It’s basically just a vamped up chicken noodle soup, (shh don’t tell my family that though, because they think it’s something super delish and special) so picky eaters will definitely have a touchstone with it and yet it pushes their comfort level out just a bit. I have one boy who hates everything on principle. He’s not picky just everything is ew and yuck until he eats it, then he likes it. He also boldly states he is a vegetarian while eating corn dogs. And New York steak makes him gag. This soup was deemed disgusting the first time I made it, yet he ate giant bowls full and gladly chowed down on it for lunch the next day. This child is why the three bite rule still stands at our house, you must eat three bites of everything on your plate, because this boy vetoes everything until he tastes it. Except for New York Steak, he never ever never likes it EVER, sigh. This is so good and so easy and makes fantastic leftovers. Picky people beware you will be eating better more delicious food in the near future! From here it’s really only a short hop to curries of all kinds, you can just say “well you DO like curry remember that soup I made? well then try this too!” Works every time! Oh how I wish it worked that way at my house. Picky-picky husband would freak out if he heard/saw curry, pesto or coconut milk. Maybe I'll make it for ME and he will "give in"…ya think? Hope so. Try it!! just make lunch for you and see what he says…it smells divine plus don't tell him whats in it!! It makes my heart glad to know I'm not the only one with an absurdly picky eater! If you can believe it, my fussbudget griped about chocolate cake with chocolate frosting being "too much." His brothers offered to beat some sense into him. This sounds like a good soup, perfect for cooler fall nights.